Thread: Material source for making checks? Sorry to disagree, but you are mistaken. A polymer jacket is much more than a lube, which is a common misconception. Polymer is as hard as copper plating and bonds better than plating to the alloy; a gas check doesn't bond at all. Polymer will withstand the extremely short duration of heat ignition, so there is no gas cutting and assuming the bullet is properly fitted to the barrel polymer seals as well as any jacket. Additionally, with polymer there is no metal contact with the barrel, which leaves deposits. 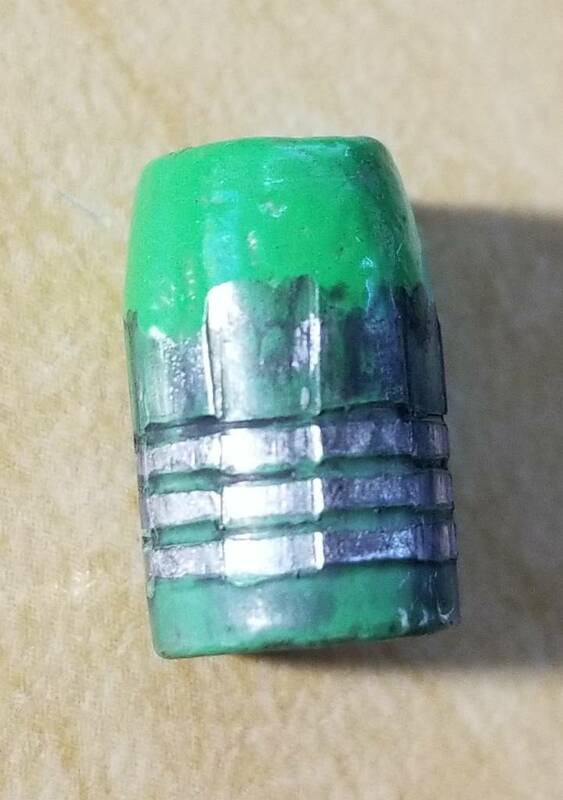 The only possible reason I can come up with to put a check on a plain base bullet is to achieve a perfectly flat base without any imperfections to aid in accuracy, but that is assuming the check is installed perfectly. If PC is tough as you say than why does it strip when fired? this is 38spl velocity. It's not as tough as plated. 2nd picture loaded 9mm round PC gets scraped off just by chambering. Another consistent source of Aluminum material is the print plates used by newspapers and print shops. Any fresh ink can be removed with alcohol. (not the drinking kind) This offers another thickness choice. Also some alu is too hard and can be annealed to soften. Life is simpler by just getting your stock from Coil & Foil. If you use roof flashing you need the proper thickness, it needs to be annealed then cut into strips. First there is absolutely no reason to have a bullet sized larger than .002" over the barrel groove. So assuming your bullet is not over sized then it has got to be your powder coating. The first step in powder coating is to start off with powder that is appropriate for your coating method. All powders will spray, but not all powders will tumble coat and even those that will tumble coat tend to vary. For this reason I recommend those starting out with PC or those having problems with their PC, purchase powder from Smoke because we know the powder he sells will tumble coat. Next your bullets must be completely clean and free of contaminants, if not the powder is not going to bond properly. A water drop is a good way to contaminate your cast bullets and that is why I recommend just air cooling your bullets. There will not be any contaminates on bullets that just come out of the mold dropped in a clean pan. If you are dealing with high humidity then getting the powder to adhere or getting a proper thickness can be a problem. I do preheating when the humidity is high. But whatever method you use the powder should completely cover the bullets with no bare spots and once cured the color should be uniform and solid without thin spots. Lastly the cure time does not start until the bullet's substraight, not the oven temperature reaches 400 degrees. An accurate thermometer is absolutely necessary to confirm your oven's operation and monitor the curing process. If you do all these things then you should not have any more problems. Pardon me gents, but this thread is for helping folks find proper material for producing gas checks. If you want discourse on powder coating methods, there is a sub forum for that. Thank you. The best I have tried so far is printing plate aluminum. After that it would be the Aluminum Beer bottles. All the pop cans I measured were the same, but they work great for plain base boollits. Sizing to .358-.359, I don't believe the problem is with powder coat. The green boolit is Eastwood PC (same as smokes) and has been properly cured, the rest of the details is semantics, I always water drop bullets, it works better for me this way and since I am not getting leading in the barrel I am not concerned about rifling cutting through PC, the question is did you actually recover bullets with PC intact in the rifling area? Do you have pictures? Last edited by dimaprok; 02-06-2019 at 04:44 PM. I use Gibraltar aluminum rolls from Home Depot it's soft enough that doesn't need annealing. I've tried annealing and found no difference. The thinner harder stuff from Lowes - Amerimax does benefit from annealing but it's a such a hassle, I can't get good annealing with a torch. As far as cutting, it's easy with paper cutter. The strips you buy from a guy in UK I am pretty sure are nice but they cost 3x and for my .308 bullets Gibraltar works really well. I have also tried printing plates and found some in .005 thickness they work good for .224, for plain base soda cans work real well, I also found aluminum blinds are about .009" work as well and are already "pre-cut" in to strips, I just don't like the white paint stripping off, same goes for printing plates. It might be my imagination but I think that the aluminum in the Coors screw top 16 oz cans is thicker than the cans that have the pull ring rip type opening. I suspect your bullets may be getting contaminated with the water drop, so lets start here in trying to fix your problems. Cast up a batch and just drop them directly out the mold into a absolutely clean pan to air dry. I don't think its a problem, but just for this batch don't handle them with your bare hands, use nitrile gloves instead. This way we have eliminated one possible problem. As far as powder I am sure Eastwood has good powder, problem is Eastwood is a company that sells to and for commercial applications. Commercial applicators spray and don't tumble coat in a Cool Whip container as so many here do. In fact when I first got into PC, I learned from talking with and watching commercial applications. These guys were somewhat surprised that bullets could be coated by shaking in a plastic tub. All the powders will spray, but most will not tumble coat or tumble coat well. I would suggest actually trying Smokes powder or send me a PM and I will send you some powder to try that I know tumble coats well. That will eliminate another possible problem. Once the clean bullets are coated they should have powder completely covering the alloy with no bare spots. If not, then humidity may be a problem and the bullets need to be preheated to 125-150 degrees F, but no more. The next thing is curing time & temperature. I would suggest doing a small batch maybe 50-100 bullets, which should come up to the 400 degree temperature quickly in a good oven. You can't trust an oven thermostat here, you must confirm with a good thermometer that the oven reaches 400 degrees and can hold it for a minimum of 10 minutes without variations. Increasing the time is better than under curing so once the oven is at 400 degrees give it 20 minutes. If you have to do a preheat you also must use a good thermometer to monitor the process. Anytime after the PC has cooled the bullets can be sized. A Lee push through sizer works well, but a lube sizer can be used also. If you have any trouble sizing a light misting of the bullets with a 12-1 mix of 99% Alcohol & Lanolin will make the bullets glide through the sizer. Sorry I don't seem to find any photos of fired bullets, but I can assure you the PC is completely intact except at the point of impact, usually from a steel plate backstop. You can see the rifling indention in the alloy of a fired bullet, but even these remain coated as the polymer stretches. I will go to the range ASAP and make some photos. 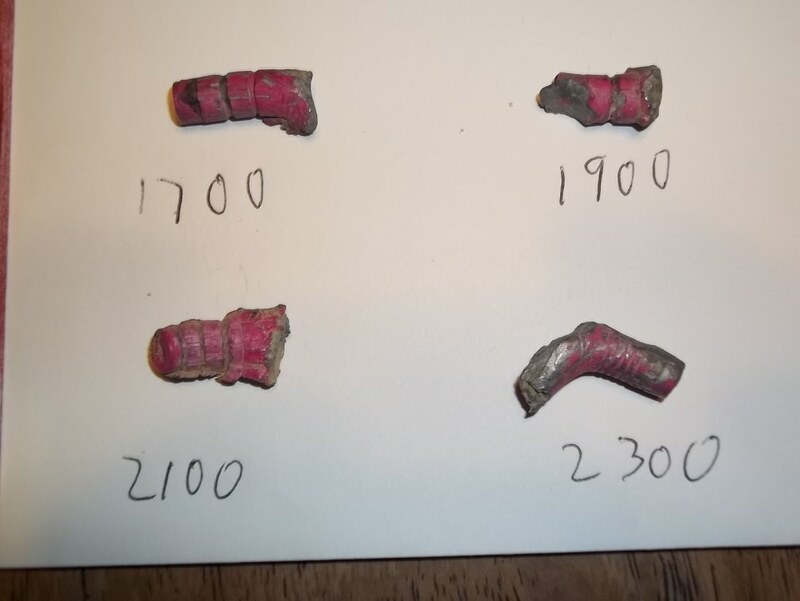 Attached are a couple of photos of coated bullets for comparison. The flattened bullets, beaten repeatedly with a hammer, show the elasticity of the powder coat. Contamination from water? Well that just puts smile on my face. The temperature in the oven is not critical even though I did 1 hour time lapse with 2 thermocouple sensors attached in 2 places and digital thermometer and because of convection it's accurate. I don't preheat anything and I've baked anywhere from 250-450 with success and as low as 12 min. Also smashing the bullet with a hammer is not same as rifling cutting in to it. If my bullets are smashed with a hammer in to nice flat pancake does that define my PC a success? BTW those purple bullets on the left look like are drowning in PC, not good for accuracy, it makes bullet non-uniform and accuracy will suffer if you shoot 50 yards or more. The blue one looks more even. P.S. I also have a spray gun that I use on rifle bullets. OK, you are to one with the problem, not me. I assumed from your posting you wanted help, which I offered. So you can keep smiling at my comments, but did you considered your water has gotten contaminated from an unclean bucket or other source? The smash test only proves the bond and the elasticity of the powder, which is evidently is missing in the photos of the bullets you posted. You tell me the temperature in the oven is not critical so you obviously know more than me, the powder manufactures and polymer physicists, there is no point on dwelling here. The coating on my bullets shown are all handgun bullets and will post under 1-1/2" 25 yard groups, which is good enough for me. 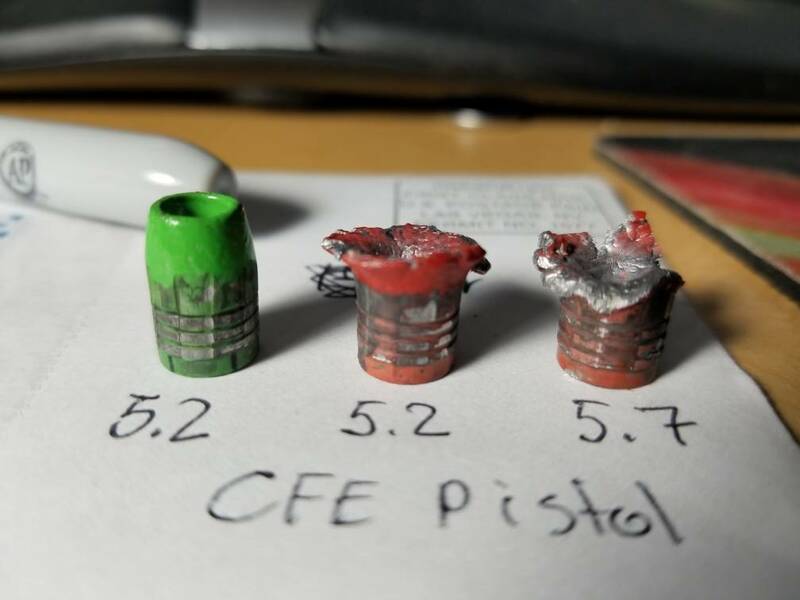 As far as a non-uniform bullet coating, bullets coming out of a mold are non-uniform to begin, which is just the physics of the casting process and the main reason of accuracy limitations. Since, my effort to help is apparently just a source for your amusement maybe others can satisfy your needs as I I am done. Easy, easy there. I meant no disrespect. I will try your suggestions and let you know, I was just sharing my experience, I think there is many way to skin a cat, I see a lot of folk having success trying and doing things differently with success I just don't think IMO PC is as tough as it's claimed to be and my experience is based on my experiments. I know people who couldn't get leading to stop with or without PC until they added gas check and hence my original claim that PC is not necessary replacement for gas check as I shown where either the rifling or gas cutting occured due to bullet being too hard is my guess, this was water quenched and too hard for low velocity 38 special, the HP bullet went through 3 gallons of water and didn't even deform! But to be honest the red bullets were not water quenched, they expanded and still showed some spots missing PC but to lesser degree. So the lesson I learned here is that PC won't stop gas cutting if your bullet is too hard. That's my take on it. Now I have exact same bullet with GC on, it just occurred to me it would be a good experiment to shoot it with same charge in to gallons of water and see if PC get damaged or not. I've had no problem with the al from lowes or ace's amerimax al rolls. Typically I go in and find a roll with the thickness I want and then test it. Testing consists of bending a exposed corner of the al. If it's hard to bend/springy I put it back and grab another roll and re-test. I imagine it's from work hardening (only a guess) I'm sure they have standards for thickness & dead soft/quarter hard/etc that the qc's check when the material comes in. I buy the rolls (a roll lasts forever!!!!) were the corner (2" x 2" triangle) is easy to bend up and stays in that position. If you do happen to get some al stock that's too hard/needs annealed it's caveman simple to anneal it. Simply cut it into strips & the next time you either make ingots or cast bullets use the hot lead/alloy to anneal your al strips. Put a pair of gloves on and grap 10 or 12 strips at a time and dunk them into the hot molten lead and count to 5. Put the strips out and wipe them with a gloved hand. Turn them over and wash-rinse-repeat. It's nothing to anneal a couple hundred al strips this way in less then 5 minutes. As far as the pc stripping off of the bullets, it's a combination of 2 things or 1 or the other. Too thin of a coating and too much fluctuation of the heat. The heat fluctuation can be magnified by high humidity. I put a thick coat of pc on my bullets just like dragonheart. These recovered bullets were loaded with loads that ranged from 38spl p+ to 9mm p+ loads to hot 357's & 44mags. I pc'd these 44cal bullets on a windy humid day. Typically I pc outdoors in a shed with the door open. The qusting wind was from the direction that would allow it to blow thru the open door and onto the oven. We had rain the night before and the wind was humid. The only time I've ever seen/experienced the pc coming off the bullet from the was when the pc was under cured/too much fluctuation in the temperature of the oven. More recovered bullets when I was testing alloys in a 308w. As you can see the slower loads that the noses shattered on the pc stayed intact. 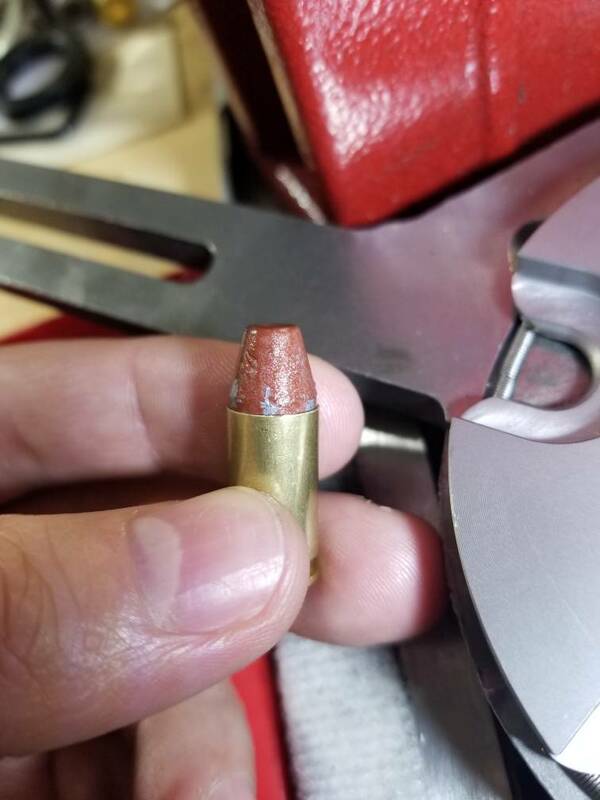 That 2300fps/50,000+psi bullet had the pc scrapped off in the dirt from the extreme bending while hitting the hard clay. Because dragonheart is correct, if you pc your cast bullets the pb gc's are a waste of time. You not only get higher velocities from the same load/bullet combo, it's easier to find accurate loads with the pc'd bullets. 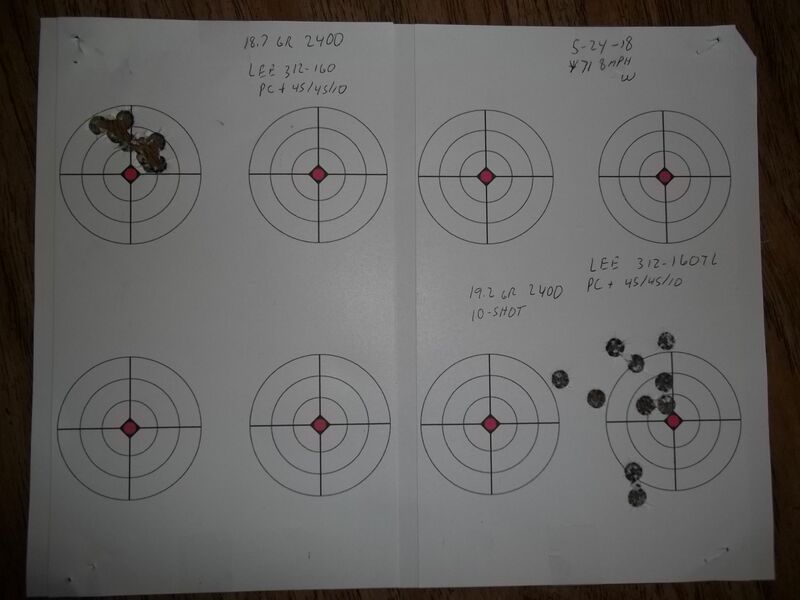 Playing around with a 308w/plinking loads @ 50yds/10-shot groups with a pc'd bullet and no gc. Why someone would say that a bullet with heavy pc on it is not accurate or that the heavy pc will destroy accuracy makes me laugh!!! Nothing could be further from the truth. A 10-shot 2000+fps moa group @ 100yds with pc'd bullets (upper left). Same bullet doing 1 1/2" 10-shot groups @ 100yds with a ladder test averaging 2679fps. But there's to many great choices out there. I quit wasting my time with pb gc's, pc is ssssoooooooo much better. I love the al gc's and don't worry if the only rolls of al I can find need annealed. It's simply caveman simple to anneal them in the lead alloy. The last coil stock I bought was off of ebay. Wanted some 17/1000th's copper coil stock & ended up buying a life time supply for $60. Forrest r, I would like to add, another way to anneal, which is my chosen method, is cut a section of aluminum off the roll and wipe on a coating of thick hand soap on one side of the sheet. Lay the sheet on a fireproof surface like concrete of lock it down in a vice. Using a propane torch, heat the soaped surface of the aluminum until the soap surface turns a uniform black. At that point you have annealed the sheet. Cutting the sheet into strips with a paper cutter will be much easier. As long as your material is the proper thickness for your needs, it will now be pliable to form perfect gas checks. You are also absolutely right about the thickness of polymer being an asset. Some seem to have never understood the PC process or can't separate their thinking from the day of applying grease to bullets for lubrication to reduce barrel leading; grease does not eliminate lead deposits in the barrel. Yes, PC acts as a lubricant, but more importantly it is forming a polymer jacket that if properly coated and cured performs all the duties of a jacket protecting the inner alloy from contact with the metal of the barrel. My major was Industrial Engineering, not polymer physics, but when I got into PC I conferred with numerous specialists in the PC field, including a retired PhD Chemist and specialist in polymer physics. My question to him among others, was could PC form a suitable jacket for accurate full power rifle loads in the 3000 fps range? He indicated a fully crossed linked polymer build out of approximately .003" from the substraight would indeed create a hard bonded jacket capable of withstanding to torque of spinup, sealing and insulating the alloy: that is what a jacket does. I personally have confirmed the polymer jacket works at and above 3K fps., however PC does not correct the inheritance long range inaccuracy problems of non-concentric cast bullets. A gas check is not a jacket, but it does seal, insulate and provide a flat base. The only reason to put a GC on a PC bullet is if you have a GC mold, in which case a properly installed check will provide a uniform flat base that the as cast bullet does not have. Going to the expense, time and effort to check a plain base bullet that is also going to be properly powder coated appears to be a waste to me as the only benefit I can see is you may gain a more uniform base, assuming the check is perfectly installed. But it's your hobby and if you enjoy doing it that is reason enough. BTW: For those that still have doubts. I know of no one who knows more about gas checks than Charles Darnall the designer and maker of the Freechex tools. Charlie will tell you the same, but give him a call and get it directly from him. As to .30-06 checks, I'll just add that I found soda can aluminium was too thin. They worked great in the .30-30, but for the 06 I needed to either use TWO thicknesses I of soda can, or go to a heavier aluminium, like flashing. Just my casual observation, I didn't do extensive testing.